Channeling the popular and funny films, Shrek 4-D is a romp into the fairy-tale tweaking kingdom of Duloc and its quipster inhabitants. Using every 3-D and "4-D" trick in the book (and then some with innovative new features), the attraction is a total hoot. With its lovable characters and rapid-fire jokes, you’ll be screaming with laughter. Locations: Universal Studios Florida and Universal Studios Japan. Note that Universal Studios Hollywood also used to present the Shrek attraction, but in 2018 it reconfigured the show building into the DreamWorks Theatre featuring Kung Fu Panda. The same folks that created the enormously popular Shrek movies, DreamWorks and voice actors, Mike Myers, Eddie Murphy, Cameron Diaz, and John Lithgow, lent their talents to Universal Studios' winning attraction. The eye-popping computer animation and laugh-a-minute style translates well to the "4-D" theater experience. For the uninitiated, "4-D" refers to a 3-D film (yes, you still have to wear those goofy glasses, called "OgreVision goggles" here) shown in a theater specially equipped to immerse viewers with an added dimension of sensory ticklers. Perfectly synchronized water spritzes, bursts of air, and other enhancements draw guests into the remarkable 3-D landscapes. Shrek 4-D takes it a step beyond with seats that move both horizontally and vertically. 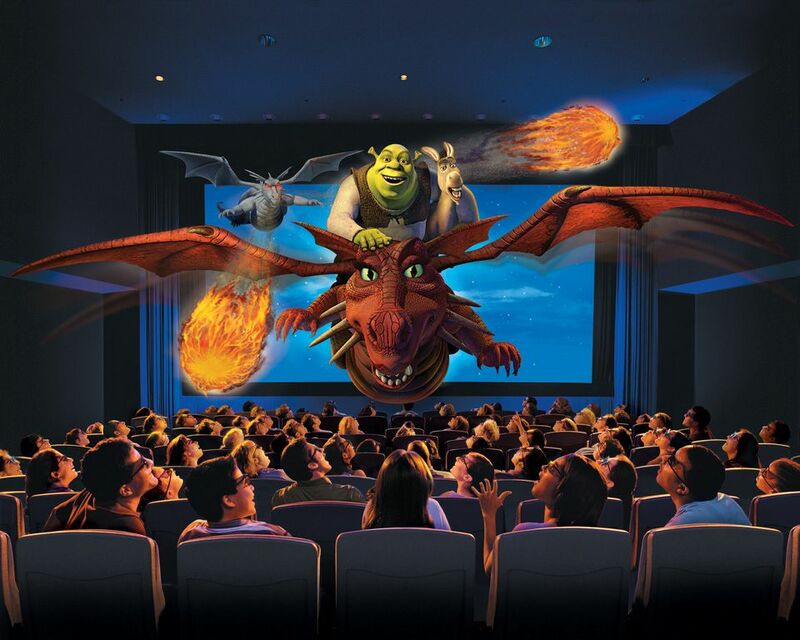 It’s not a motion simulator attraction per se, like Back to the Future or Disney’s Star Tours, but the seats do incorporate a surprising amount of motion, and Shrek 4-D straddles the line between a theatrical presentation and a ride. A hillarious pre-show establishes the story. The imprisoned Three Little Pigs and Pinocchio along with The Magic Mirror explain how the ghost of Lord Farquaad, supposedly vanquished in the first Shrek film, is causing havoc from the great beyond. The loathsome lord himself appears onscreen and announces his intentions to steal Princess Fiona away during her honeymoon with Shrek, kill her, and make her his ghostly queen in the underworld. He informs us intruders that we are now his prisoners. Farquaad instructs his henchmen to prepare the auditorium, and explains that he will use torture devices (the moving seats) to get us to reveal the Princess’ whereabouts. It’s never quite made clear how or why the audience would know Fiona’s location. And there is a disconnect between the pre-show and the main feature. Once the show begins, Farquaad never interrogates us for any info; in fact, we are mere third-party observers of the action (albeit, with an incredible vantage point) as it unfolds. The story itself is a tad lame, but the telling of the story is so engaging and funny, it’s easy to forgive all of the lapses. A big part of the fun is at Disney's expense. The Shrek films ruthlessly skewer sacred fairy tales and take special glee in directing barbed zingers at Disney. The Shrek theme park attraction adopts the messin'-with-the-Mouse mantle. Given Universal Studios' proximity to Walt Disney World in Florida, it's even more outrageous to catch the sly references. For example, the presentation begins with the adorable Tinker Bell flying across the screen, dispensing her pixie dust...and getting eaten by a frog. And you have to love the poster in the queue that advertises the "Enchanted Tick Room" located in "Parasiteland." The Shrek sensibility fits the Universal attraction mold: loud, wild, and in-your-face. Where Disney excels at establishing or rekindling warm, fuzzy childhood memories, Universal is the rebellious adolescent that wants to blow everything up. For all of the theme park conventions it blows up, however, Shrek 4-D doesn't stray too far from the tried and true. I don't think I'm giving too much away to reveal that the green ogre gets his princess in the end, and everyone lives happily ever after. Except for Tinker Bell. Apparently pixie dust and wishing upon a star are no match for a frog.